(New York: Schocken, 1976), 169. I think I would have acted the way you did, that is to say, refused the request of the dying SS man. 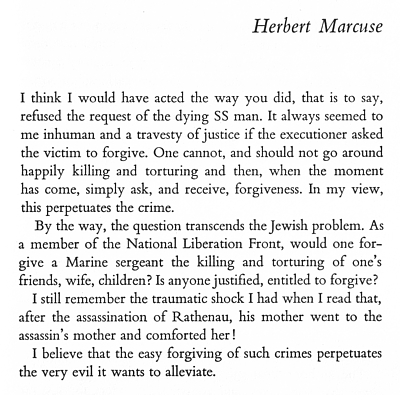 It always seemed to me inhuman and a travesty of justice if the executioner asked the victim to forgive. One cannot, and should not go around happily killing and torturing and then, when the moment has come, simply ask, and receive, forgiveness. In my view, this perpetuates the crime. 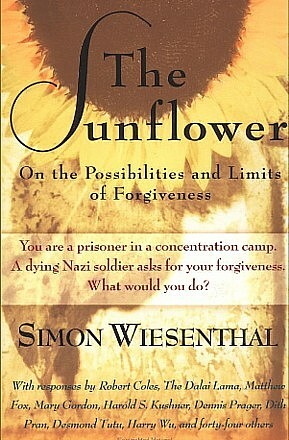 By the way, the question transcends the Jewish problem. As a member of the National Liberation Front, would one forgive a Marine sergeant the killing and torturing of one's friends, wife, children? 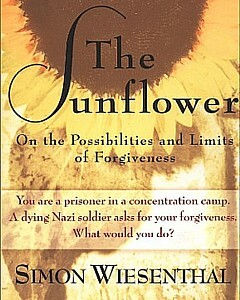 Is anyone justified, entitled to forgive? I still remember the traumatic shock I had when I read that, after the assassination of Rathenau, his mother went to the assassin's mother and comforted her! 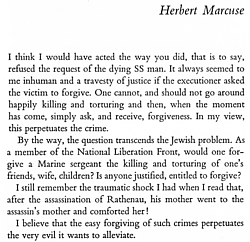 I believe that the easy forgiving of such crimes perpetuates the very evil it wants to alleviate. Herbert Marcuse (1898-) left his native Germany in 1934 to teach philosophy at Columbia University, and subsequently at Harvard University, Brandeis University, and the University of California at San Diego. During World War II he served with the U.S. Office of Strategic Services and the State Department (1941-50). He is the author of numerous books including Eros and Civilization, One-Dimensional Man, Counter Revolution and Revolt, and Studies in Critical Philosophy.